Bullard died at the age of 59 of complications from emergency heart surgery he had last week. Following Bullard’s death, two of the three defense attorneys in the Lompoc murder trial motioned for a mistrial. 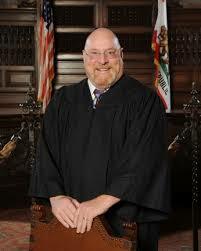 But, Bullard’s replacement, retired Judge Rick Brown, denied the motion. “There’s not case-law that I know of that says when a judge dies in the middle of a trial automatically there’s a mistrial,” Brown said. All three defense attorneys additionally filed declarations of prejudice against Brown and requested that he step down from the case assignment. Brown refused to leave his role as replacement judge and said the law permits him to stay. Prosecutor Stephen Foley said he was “absolutely” ready to proceed with the remainder of the trial. Brown pledged to review trial transcripts. Three Lompoc residents, Gregory Wallace, Christopher Jaime and Roberto Castaneda, stand trial for the January 2010 fatal shooting of Lompoc resident Isidro Madera. The trial resumed Tuesday after a moment of silence for Bullard. My condolences to the judge and his family. First off I have to say that I am not a lawyer, so take what I say for its worth. It seems to me that a judge needs to be there to preside over the proceedings, set rules of engagements, and be a sort of representative of the law itself. If part of the trial is sort of in the books I wouldn’t think there should be a huge issue with another judge stepping in. The only thing I can think of, as a layman, is it could set off a complicated series of lawyers from either side going back and trying to readdress earlier decisions. For example the first judge may have allowed something in as evidence, but the new judge might be willing to go the other way. Could sort of slow things down. I am surprised at how fascinated I am with this question. Also, I don’t remember who said it, but I have to concur with the person who earlier made the remark about being about the idea that after centuries of American law, this has somehow never happened before. If this is a jury trial, I can’t see a problem, unless they are at the stage where the judge charges the jury with instructions on how to proceed in deliberations. If it’s a trial by judge with no jury, then it shold be a mistrial and start over. Rick Brown is the judge who found for the county and the regional water board against CAWS in the Los Osos Sewer project backin the early 1990s. Brown said there was sufficient evidence that septics were polluting the groundwater and the water board had the authority to force a sewer be built. In the history of law, no judge has ever died mid-trial to create case law? Really??? You’re missing the strength of his statement. A judge doesn’t say “I think” in the same way you’d say “I think theres enough gas in the lawnmower”. When he says “I think it’s ok” then you should realize who you’re hearing it from in the first place. See my reply to Roy below. O.k. so I agree that it shouldn’t be a problem BUT I’m a little concerned when I hear Brown make this comment………….”but I think it will be legal.” It shouldn’t be an I think. It should be YES it is or NO it isn’t. He left himself WIDE OPEN to interpretation and mistrial at a later point, which is more money and time wasted. YUP, The “I think” caught my attention too. I guess he’s testing the waters but there will be an appeal for sure when these murderers get convicted. The “I think…” caught my eye as well, but realistically, who the heck would know on the tip of their tongue if this situation is, in fact, legal. I mean, judges dying mid-trial are not the norm, so I’ll give the replacement judge a bit more rope here. Hopefully, “people” are working on it to find out if it is legal (or rather, that there are no laws against it). It’s not me who has trouble giving him leeway. I really don’t care. BUT we are talking lawyers. Lawyers will misconstrew everything they can to get a case to go their way. They obviously already tried with the death. So I can see it coming up later and as a taxpayer WHAT A WASTE! That was my point. Your last statement IS what he should have said. He could have said something like…..we here locally haven’t had to deal with this in the past and are looking into how we can proceed. THAT is how you don’t leave loopoles. Just a thought.